Hang on a minute - something isn't right here! I have just come back from Download and nothing is covered in mud. I got a tan and my wellies only saw the light of day briefly the whole weekend! As hard as it is to believe I have just experienced by first DRY Download. Mr Fox and I were at a bit of a loss - the ponchos never made it out of our bags and getting in and out of the tent was far simpler as we didn't have to worry about a cascade of water off the tent door dripping onto the sleeping bags. Weather aside this has probably been one of the best Download's we have been to. Ok, the weather helped as we were not sheltering from the rain at any point and were free to roam the site without the mad poncho dash but the bands playing made for a very hectic weekend where we managed to average around 30,000 steps a day! That is a lot of walking!! The day got off to a good start - we got out the house pretty much on time and didn't face any traffic woes. We got into the South Car Park which is MUCH nearer the campsite than the West Car Park which we had to park in last year. We went from parked to pitched in a new record of 45 minutes, so we broke out the picnic blanket and the selection of craft beers we had brought with us and geared ourselves up for the day ahead - checking the app to see which bands we wanted to see and what we would be doing over the course of the evening. After a few cans of light refreshment we headed to the arena. Security was stepped up for this year in light of the recent terrorist attacks. I did have to laugh though when I got patted down considering I was wearing short shorts and a vest top. Not sure what the guy thought I was hiding in the skin on my legs!! 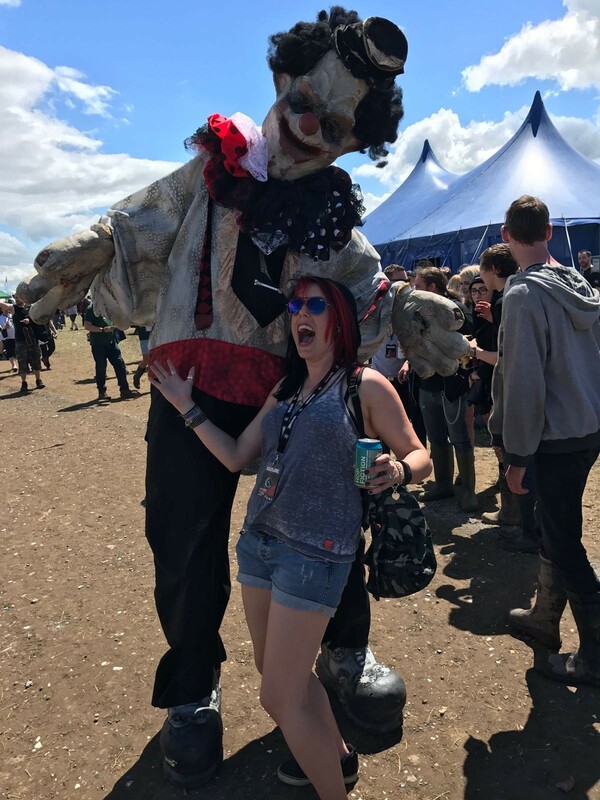 A rare sight at Download - sunshine! Despite the latest start time on the Friday we started off with Motionless in White followed by a little bit of Sabaton. We then ventured over to the second stage and caught a bit of Machine Gun Kelly before heading to the Main Stage for one of the days highlights Mastodon. We then went back to the second stage for a bit of Suicidal Tendencies although I was gutted that I either missed or they didn't play Institution. And then we saw Baroness which was one of the highlights of the weekend. The band have suffered a lot over the past few years since their tour bus crashed in Bath after a gig in Bristol. It was lucky that they all survived and were able to continue but slowly members have left the band to the point John Balzy is the only original member left. A couple of weeks before Download their guitarist left. Step forward Gina Gleason. I have to say I had a proper girl crush by the end of the set. She is an amazing guitarist and definitely brings a lot to the band. I look forward to seeing more of her and hearing what she and the band produce on the next album. I have to confess, I had no idea who the next band were when we went to see them. I had heard some Prophets of Rage on the Spotify Download playlist on the drive to Donnington but hadn't looked too much into them. When they took to the stage I stared at them saying to Andy "Have we seen that guy before? He looks really famillar." Queue facepalming moments when I realised that the familiar bassist was Tim Commerford from Rage Against the Machine along with the one and only Tom Morello as well as Chuck D and DJ Lord from Public Enemy and B-Real from Cypress Hill. They played an amazing set with hits from all their bands , as well as House of Pain's Jump Around. They paid tribute to the late Chris Cornell (who Tim and Tom had played with in Audioslave). They didn't sing. Just played. And the crowd sang along. It brought a tears to my eyes. Tom Morello showed exactly why he is one of the hardest bosses to beat on Guitar Hero with some blistering solos. He also made it quite clear to the crowd his feelings towards the President of the United States with a F**k Trump sticker on the back of his guitar. Of their own songs "Unf**k the World" went down a storm with the crowd. And to finish - well wasn't going to be anything but "Killing in the Name of" really. And it sounded amazing even without Zack De La Rocha on vocals. To round off an already amazing day we watched headliners System of a Down. I hadn't seen System since 2004 when they released their two accompanying albums Hypnotise / Memorise. I was excited and I wasn't disappointed even if the performances felt a little too polished. Sadly no new songs which somewhat quashes the hopes I had for a new album this year (come on guys is been 13 YEARS!!) but nonetheless they played a great set. Chop Suey was by far the highlight. I have never been so deafened by the crowd singing along to a track before. It was amazing. At the end of the night we headed back to the campsite village for cheese and onion toasties and more beers in our favourite night spot from last year, Hair of the Dog - a "pub" in the campsite (well more a tent with a muddy dance floor but lots of nice ales). We danced a bit but we were not massively feeling the music and I was a little tired after the early start so we headed back to the campsite which was thankfully fairly quiet this year. The day started as I feared it might go on. At 5am I woke up desperate for the loo hearing the all too familiar sound of heavy rain hitting the tent. I decided to wait for the rain to ease before braving the toilets. At 6am the rain stopped and I headed out. The ground wasn't too wet but I wore my wellies as a precaution. It is always so hard to tell if a rain shower like that has turned other areas of the site in a quagmire but luckily this time round it didn't. Nonetheless I decided to wear my wellies for the day, a decision I later regretted as the ground firmed up. For once we headed into the arena before the bands has started. We were greeted by armed police - a site you don't necessarily expect to see. First band of the day were Hacktivist. Glad I did. Will definitely be getting some of their albums for my collection. Next up was Greywind - a band I have been trying to catch live for a while. I missed them supporting Thrice so was glad to finally see what they were about. Lead singer Steph O'Sullivan definitely didn't pack any punches and her voice carried well in the fairly packed tent. They ran though most of last year's album Afterthoughts before ending with the title track, one of my favourite tracks from 2016. We headed to the main stage to see a bit of Creeper, a band neither of us knew much about. They were really enjoyable and great early afternoon listening. They finished with I Choose to Live in tribute to the victims of the terror attacks in Manchester and London. Back to the second stage for Alestorm, a band we were looking forward to seeing after their performance at Sonisphere in 2014. A number of people in the crowd had dressed as pirates for the occasion. Out stepped front man Christopher Bowes and I remembered exactly why they captivated me at Sonisphere - KEYTAR!! You don't often see that and again I was fixated seeing their energy on stage with a set of songs about alcohol, going out and alcohol and going out. We did a quick tour of the stages at this point catching part of Of Mice and Men and Pierce the Veil before heading to the second stage for one of our favourite Norwegian band's Kverletak. Missed that they had released a new album but still Mjöd was the highlight. Another wander this time to get some food and then heading up to the fourth stage to catch the Lounge Kittens. Annoyingly we couldn't get anywhere near them, the tent was full and people were spilling out trying to catch a glimpse. We still managed to catch a medley of their unique take of some rock classics before giving up and heading down to the main stage to catch AFI. At this point I managed to meet up with some old friends, a welcome addition to any Download weekend before heading over to the 3rd stage to catch Every Time I Die. Their performance of We Are Wolves was one of the stand out moments for me of the day. Back again to the second stage this time to see The Devin Townsend Project. Now, I spent a lot of the set trying to work out if JK Rowling was a fan or if Ralph Finnes was - either way some of the facial expression Devin was pulling I could not help but think of Voldermort. That aside their set was one of my highlights of the day and was great to see a band I didn't know much about and be pleasantly surprised. I also liked how humble he seemed even giving out group hugs at the end of the set to security and others. After that we wandered round the back of the second stage to the WE tent to see some NXT wrestling. Usual nonsense as you would expect, a "bad" guy and a "good" guy fighting it out. And just as it looks like the "good" guy is about to lose he makes a remarkable comeback to win. Great fun to watch though! Onto the main stage to catch a bit of headliners Biffy Clyro - I have seen them a number of times now so I didn't want to stay for the full set so I could head over to the second stage to catch headliner Rob Zombie. Biffy though were as good as always. They are still one of the best live bands in my opinion. We even caught a glimpse of Mike Vennart playing in the wings - the unofficial 4th member of the band when touring. Finishing up at the second stage we watched an amazing set by Rob Zombie. Definitely surreal and looking like something from the 70's glam rock era it was a set that didn't disappoint. There were fluid filled guitars and guitars with lots of lights. We were treated to two great covers - Blitzreigpop and School's Out. He played classic tracks as well that made me smile - Dragula and More Human than Human. I was glad to finally see him live. As we headed to the exits, we realised the main stage hadn't quite finished so were stuck waiting to leave as the other exits had not yet been opened. So what does a group of metal and rock fans do when stuck in a big queue? Sing Bohemiem Rhapsody. It started with a few people and then spread like wildfire across the gathered masses. We opted for a quiet night that night as we were both tired so we headed back to the tent. Day 3 and yet more sun!! The last day seemed to come round so quickly this year, perhaps because we were not spending time avoiding the rain. A slightly later start than Saturday due to the need to drain our craft beer supplies rather than have to carry them home the next day. It was also a mega day of walking with another 30k+steps! (over 95k steps for the entire weekend! First up and whilst having a cuppa at Motley Brew, we watched the Dead Daisies. A great start to what is traditionally classic rock day. Next up we saw Red Fang. It's been a while since we saw the guys and they certainly didn't disappoint. A great set of old and new tracks and a listening performance of Prehistoric Dog to finish with. Hanging around at the second stage, next up was Devil Driver who definitely got my vote for circle pit of the day. Another jaunt down to the third stage saw us catch a band we saw supporting Future of the Left back in 2009 - Dinosaur Pile Up. Still a great band. Running to use the loos next to the main stage I caught a little bit of In Flames but no tracks I recognise before trekking over to the fourth stage to see a bit of Love Zombies - much more rock n roll than other bands. Next up a quick look Anathema - a female fronted back with two drummers (always love a bit of extra drums!) before catching a bit of Airborne. Have to say that i have never really been that sure about Airborne but the small bit of their set that I did catch I actually really enjoyed. Touche Amore next - all I could think thought when I was watching them was a metal version of Sheldon from The Big Bang Theory. Still, they were enjoyable. We hung around at the second stage to catch Clutch. 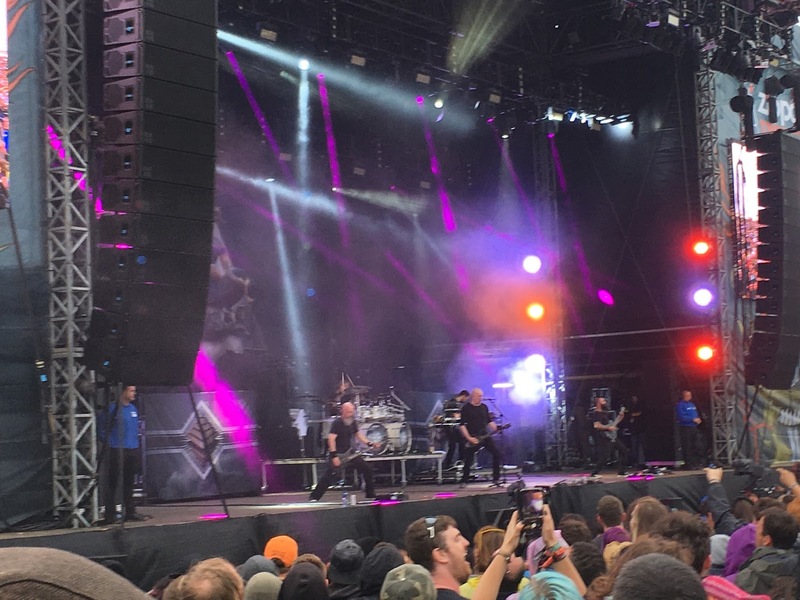 We were fortunate the last time they played at Download to see them from the side of the stage but to be honest it was much better being out the front and watching them. They played a great mixed set with classics from their older albums and the best tunes from their last album (never going to get bored listening to X-Ray Visions) and a new song which along with other bands across the weekend seemed to be a f*** you to the American voting system. We then caught some Basement and Opeth whilst having a wander and then caught Perturbator - his music could easily be featured on a number of video games. I love a bit of metal/dance music crossover but it is not normally Mr Fox's bag but he quite enjoyed what we saw. We saw a tiny bit of Slayer whilst walking over to the third stage to catch Dillinger Escape Plan's final performance in the UK. Unsurprisingly we couldn't get into the tent but we managed to get a good spot just outside in the sun. Despite being outside the sound was deafening. I was happy enough hearing Milk Lizard for the last time live. They played a number of hits from across the years and I am sad I will not get to see them again. That said I am glad they are going out on a high! We are not really massive fans of Aerosmith so we were not too fused about seeing them but as everyone else seemed to be we took the opportunity to wander around the site and opted to have a go on the big wheel. Its been at the festival a number of years but we have never been too fussed about going on. We had been missing out! The views were amazing. We got a great view of the site and were able to see the sheer number of people watching the main stage. It was amazing although a bit windy. We got some amazing shots but could do with a better camera for next time. After our wheel ride we decided to head back to the campsite village for a wander before everyone came back. Have to say the shop options were a little disappointing this year. There didn't seem to be as many across the whole site and what was there was not great which was a shame. We decided to have a couple of closers in the Hair of the Dog before hitting the tent for an early-ish night as we had the long drive back on Sunday. Well that was the plan. The music was great and we were soon joined by my friends we had met up with on Saturday. Many, many beers later (well for Mr Fox - I at least had the foresight to realise I was driving in the morning and switched to soft drinks around 11pm) and we were tearing up the dancefloor again, creating a leaning tower of plastic pint glasses and having a brilliant time. Eventually I dragged Mr Fox out around quarter to 2 and then made the mistake of walking through the other tent who were being entertained with a DJ set from the Ultimate Power DJ's. Chris Cornell came on and Mr Fox was heading to the crowd. Just after 2 I managed to drag him away but even I was struggling not to keep dancing. Obligatory 2am and we are still partying and don't want to leave Download shot! So Download 2017! It was great. I amassed an impressive 116,686 steps across the weekend (a normal weekly total), drank more than I can count and had an absolutely wonderful time. But there were a couple of pain points. Bar queues for starters despite appearing to have more bars that previous years. They allowed the use of cash again this year which slowed things down and although I used contactless all weekend, the machines were no where near the bar so staff spent time wandering over to the till to get the machines everytime we ordered which was frustrating. No Somersby Manor house this year either which despite the dry weather was also missed. We definitely missed 2 Manor DJs providing some tunes in between acts and a place to go for a quiet drink. Food prices. I don't mind paying for good food but I did feel the prices this year were steep and would be harder for anyone on a budget for the weekend to meet over all three days. Appreciate food costs are increasing but £7 for halloumi chips? Sorry but I don't even thing the stall in Camden that pioneered them charges that much and you get more with them that I did. Halloumi chips - lovely but not worth £7! Next gripe was the lack of toilets in the arena. There definitely were less that previous years and it showed as queues were huge causing me to miss parts of sets on a number of occasions. Disappointing when it hasn't been an issue in previous years. And lastly, and this was what annoyed me the most, the "Guest" area. The guest area has always been there but hidden next to the main stage. This year it was visible to all and looked like part of the main site. But if you wanted to access this little haven with extra bars, toilets and food stalls you had to pay £40 per day to enter. Something rankled with me on this. Download for me has always been about inclusion and a great festival for all and this seemed to go against that promoting diversity by allowing those who can afford it to enjoy it while excluding those who could not. I hope it goes back to it's usual place next year and doesn't promote itself in quite the same way. Also for anyone thinking you can go there and see lots of bands, you won't. I have been lucky enough in the past to be an actual "Guest" and in the guest area you will see a few smaller bands, couple of media people and those who had paid for RIP camping but you are very unlikely to meet Lars, Corey, Serj and the like. All in all though a great weekend and I cannot wait to get back there next year and do it all again! !